In the personality community, some of the biggest targets of condescension and superiority are the sensing personality types. Why is this? I’ve had a number of theories, ranging from poor type descriptions, to the reality that many intuitives are misunderstood in a largely sensing world and therefore lash back at sensors in a misguided sense of “justice”. Either way, these misconceptions are doing nothing to help anyone, and they are so ridiculously false that it’s laughable. So let’s get started dismantling some of these errors. I really don’t know where this misconception started, but I’d venture to guess that it began with intuitives who were struggling with getting past the sensing/intuition communication gap. ” They only like small talk!” I’ve heard many intuitives say of sensors. “Can’t they get back to reality?” I’ve heard sensors say of intuitives. 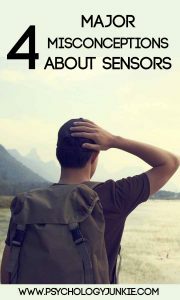 In general, sensors would rather discuss topics that have a practical application (although they can enjoy venturing into theoretical territory sometimes). Intuitives enjoy more abstract, theoretical conversations. This can mean that what sensors find stimulating to talk about intuitives find boring, or vice versa. Mother Teresa, Audrey Hepburn, Harry Houdini, Theodoore Roosevelt…all of these individuals are sensors, and “boring” is certainly the last word that comes to mind when I think of them! Boring is really a very relative term, anyway. What is boring to one person may be completely fascinating to another. This misconception is actually perpetuated in many professional typing circles. When I took the official MBTI® certification course we were asked to sort a bunch of adjectives into dichotomy boxes. We would sort words like “logical” and “warm” into boxes titled “thinking” or “feeling”, etc,. As we did this we came across the word “creative”. Several of the people in my group automatically put this word into the “intuition” box. I argued that it couldn’t be in either box, because creativity isn’t limited to intuition or sensing. Our instructor agreed with me, and admitted that the activity was a little overly-simplified and stereotypical, but it was part of the curriculum so we kind of “had” to do it (albeit reluctantly). Sensing is more creative with tangible reality and physical objects and intuition is more creative with theories and ideas. I’ve known sensors who can create the most astounding works of art or beautiful pieces of music. I’ve known sensing dancers who can come up with their own choreographed performances. There is usually some tangible, physical aspect to sensing creativity and intuitive creativity is usually more focused on theory, abstract-data, or potential “could be’s” and “what if’s”. Neither sensing or intuition is limited to the tangible or abstract world, however. Intuitives can have tangible/physical creativity and sensors can create eye-opening theories. This misconception comes from a “twisting” of the idea that Introverted Sensors favor “tried and true” techniques. Because Si-users favor tradition and enjoy being part of a community many people assume that this means they will conform to any community or tradition they’re a part of. This just isn’t true. Sensing types will look for traditions they can respect and value (balancing their decisions with logic and values) and then try to uphold those traditions. As an example, my in-laws (an ISTJ and an ESTJ) started homeschooling their children in the 80’s. Homeschooling was actually illegal at that point in time in their state, and it was widely looked down upon in their community. They had to homeschool in secret and their choice to do so flew in the face of “tradition” and the values of the community. They had no problem eschewing the standards of that day. Simultaneously, they created a new community with a new set of traditions. They created homeschool groups, wrote for homeschooling papers, encouraged other people who were interested in homeschooling, and became major proponents of the homeschooling movement. They were far from conformists, but at the same time they did favor traditions they created. Their traditions had to align with their values and their sense of logic. Sensors are generally very careful about the traditions and conventions they align themselves with, they will not “blindly” adhere to just any rule or structure that already exists. I covered this in great detail in my article “Are Certain Personality Types Smarter Than Others?”. The conclusion was that neither sensors or intuitives are smarter than the other, but they do tend to have different types of intelligence. IN personality types tend to perform better on standardized tests, but Myers and McCaulley explained that that’s because intuitives tend to trust their “hunches” more when taking timed tests and sensors tend to second-guess themselves and want to be “sure” before moving towards the next question. As a result, timed tests tend to favor intuitives, but sensors would likely have similar scores if they trusted their hunches and didn’t go over their questions a second time. – Myers and McCaulley, MBTI® Manual 1985, pp. 109-110). Sensors tend to have a natural gift for naturalist intelligence and bodily-kinesthetic intelligence whereas intuitives tend to have a natural gift for existential intelligence. Thinking types tend to excel in logical-mathematical intelligence, and feeling types in interpersonal intelligence. The important thing to remember is that these types “tend to” excel in these areas, but there are many types who break the mold. There are many feeling types who excel in math and thinking types who excel with people. Your type won’t limit you to only one type of intelligence. Have you struggled with a misconception about your type? Let me know in the comments! Maybe that can be the topic of another article! Are Certain Personality Types Smarter Than Others? Wow…as a INTJ homeschool mom of several sensors I am impressed with your assessment. Great job! I’m also 20 years married to my ESFP husband. Amazing huh?